My love for Gus began on what I called “the best car weekend ever.” That happened in September 1999 when Bosch was promoting its Blaupunkt car audio systems by tricking out a New Beetle with top-of-the-line receivers and speakers such that the sound nearly lifted the little car off the road. The yellow Bug was covered with black semi-abstract, grafitto-like line drawings (stick figures, wavy arrows, musical notes, etc. ), so it attracted more attention than even the average cute Bug. Best of all, Bob arranged with Bosch to let us use this awesome car for the weekend, thus assuring his place in heaven. The girls and I cruised Naperville for two days blasting “Gangsta’s Paradise,” the Red Hot Chili Peppers, and probably the entire Beastie Boys oeuvre. The noise police were too awed to try to stop us. Well, shortly after that, as luck would have it, we were in need of a new car, and there was no other choice than our own New Beetle. 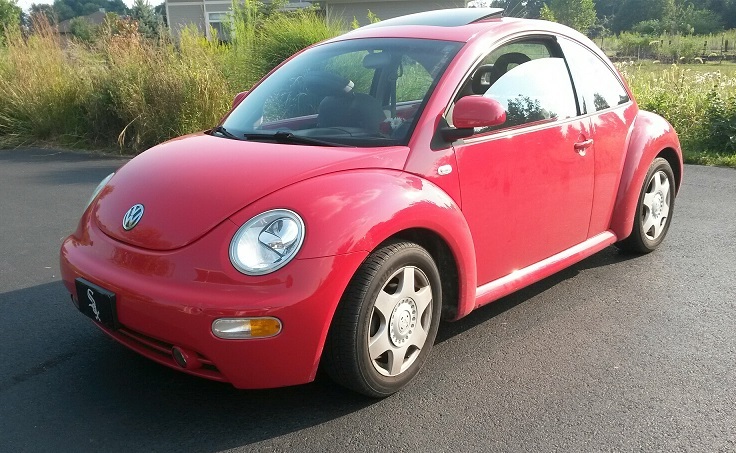 It arrived on January 26, 2000, bright red and cute as a bug. I named him Gus, after the adorable round mouse Gus Gus from Disney’s Cinderella. I wrote, at the time: “What a cutie! I love the way Ali’s friends squeal when they see it…[Bob’s good friend Luke,] a tall, manly looking man…told Bob that he thought the Beetles were ‘cute.’ Bob just shook his head sadly, having forbidden his immediate family from ever again using the word ‘cute’ in his presence.” Ali “drool[ed] at how cute it looks in the garage,” and Lori took the key–not the car, just the key–to school to show it off. Gus had a manual transmission. Our reasons for getting a stick were (1) because Gus was my sports car and (2) so that the girls could learn to drive one. After Lori’s first lesson, I wrote this: “I hope that baby New Beetles with manual transmissions have baby teeth on their gears, because Lori ground off a couple of the teeth on my baby yesterday when I was teaching her to drive the stick shift. ” She eventually succeeded, and a few years later even took Gus to college for a semester, during which time he gained a Gamma Phi Beta sticker on his rear window. Ali also learned to drive Gus, but after a traumatic stall-out at a busy intersection refused to drive him ever again. Her loss–but she and I had some great road trips with Gus with custom playlists blasting from the CD player. I loved Gus to the point that I worried about being in a state of sin as a result of coveting a material object. There are many stories I could tell about good times with this car. But inevitably he got old. In car years, he was about 150 years old, even though he only had 73,000 miles on him, and various parts were giving out. Sadly, the time came to let him retire and get a larger car that will fit more grandkids. The new blue Subaru Outback arrived yesterday, on my sister’s birthday. I’m toying with naming her “Bess” after my dad’s nickname “Messy Bess” for that sister. However, I’ll have to get to know her first…and it’s too soon after the loss of Gus. I will miss Gus. I grieve. Next Article Next Article: Ready, Set, Go Age (with Energy and Pizzazz)!